After fifteen years, I’ve decided that making soap and life have a lot in common. Both involve a long learning process, can be joyful and frustrating and have taught me many things. There is no one perfect bar of soap or one perfect way to live. In a bar of soap, some people want large bubbles and lots of them. Others want a creamier feel. Some want scented, some unscented. Some like essential oils, some only like fragrance oils. Some want added botanicals, glitter, round shape, rectangle shape, square shape, color, no color, you get the picture. My idea of a perfect bar of soap and a perfect life will be different than yours. I like a routine, you may crave adventure. I like living in the suburbs, you might enjoy the excitement of city life or the quite of the country. Each of us chooses what is right for us. If you want to make a good bar of soap, or a good life, surround yourself with quality ingredients and quality people. I won’t use old oils for my soap, they will turn my soap rancid quickly. I need to invest in a variety of good, quality oils. This way, when I formulate my soaps, I don’t have to reach far to find what I need. Just like I want quality people surrounding me in my life. Friends who will laugh and cry with me, who will support and encourage me. Friends who will help me be that same kind of friend to them. 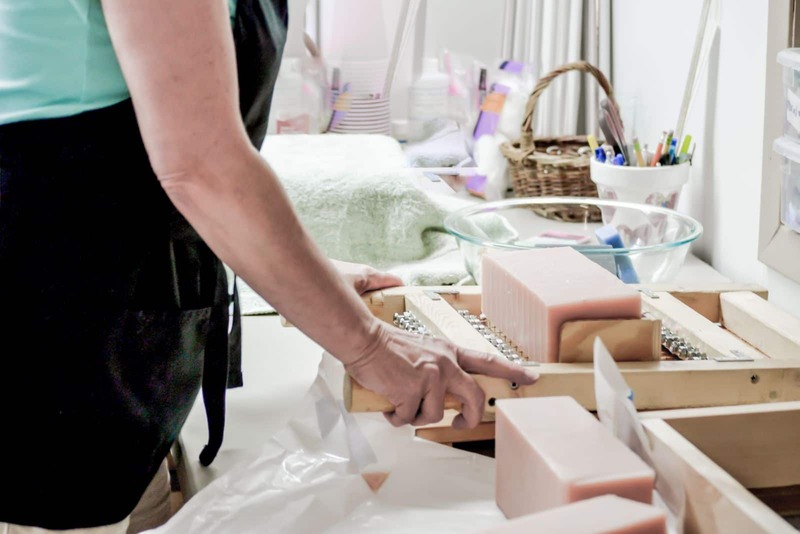 Don’t be afraid to make a mistake in making soap or in life. One August, I decided to try making a red soap. I was hoping to do a red and white striped candy cane for Christmas. I bought what I thought was a red mica (mistake #1), and made a very large batch (mistake #2). I got fancy, swirled some activated charcoal in it and let it cure. I loved how it turned out….until I used it. It bled red. I mean, it looked like Psycho in the shower, it was that bad. I looked at the mica and realized I used a bath bomb color, so at least it was body safe. But what was I going to do with all that soap?? Took me a few days but since Halloween was the next month I called it “Vampire Soap”, put a label on it that said “caution, bleeds red” and sold it as a gag gift. Turned out to be my best mistake. I had to make another two batches, and now I make it every August. Life seems to follow suit. If you mess up, see if you can make lemonade out of the lemons. If you can’t, learn from the mistake (read what you are buying before you buy it & experiment in small batches) and move on. If someone snubs your soap or you, don’t take it personally. I like lavender. In fact, I absolutely Love lavender. Most of my soaps have lavender in them. Hard for me to believe, but some people don’t like lavender…in face, some people Hate lavender and therefore, hate my soaps. (I know, shocking….) Some people don’t like me either. Maybe I remind them of someone in high school they didn’t like. Maybe they are busy with their own life and just don’t want any new friends. Maybe it isn’t about me anyway. Whatever. I’m not gonna waste my time trying to change their mind, about me or about lavender. God bless them on their way. We need to take time to enjoy the soap and the life we create. When I create a new scent, I want to breathe it in. When I create a new formula, I want to feel it on my skin. I want to enjoy my soaps. It won’t be in my shower forever though. My soaps last between three to four weeks and then it is gone. I can recreate it, but it isn’t exactly the same. Life is also short, and each moment is different. I swear yesterday my kids were toddlers, today they are grown and out of my house. I was so busy raising them I have no clue where that time went. I’m determined to make the best of what I have left. I want to spend time holding my husband’s hand. I want experiences and laughter and friends to share them with. I want to see more sunrises and read less newspapers. I don’t want to be in a constant state of doing, I want to enjoy my soap and my life. What do you do and what have you learned from it?